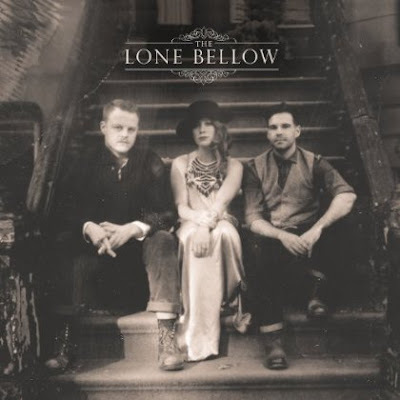 Discussions Magazine Music Blog: THE LONE BELLOW: Self-Titled debut album available NOW! THE LONE BELLOW: Self-Titled debut album available NOW! 2013 debut from this trio that hails from Brooklyn via south of the Mason-Dixon. The Lone Bellow (formerly known as Zach Williams & The Bellow) have made a name for themselves with their acclaimed live shows in New York and across the country during their stint opening for Grammy Winners The Civil Wars. Featuring lead singer and principal songwriter Zach Williams, singer and mandolin player Kanene Pipkin and singer-guitarist Brian Elmquist, The Lone Bellow isn't just a group of musicians; they are an "urban tribe," a family away from family. The album was recorded at NYC’s Rockwood Music Hall over three days and was produced by Grammy Award Winning Producer Charlie Peacock (Civil Wars) at The Art House studio in Nashville.